India's 31 position rise in the FIFA rankings is second only to FYR Macedonia's 33 position move to 133. India has done what seemed impossible just a year back. Having won two away matches on FIFA match days, India has jumped an amazing 31 positions to rank 101. This ranking, India's highest in over two decades, was made official the latest FIFA rankings released on Thursday, 6 April. India are now the 11th-ranked team in Asia, behind Qatar and ahead of Jordan. In fact, so rapid was India's rise that India was the second most improved team, beaten only by Former Yugoslav Republic of Macedonia (FYR Macedonia) who climbed 33 positions to 133. India have now won 11 of their last 13 games, scoring a total of 31 goals. This is India's highest position since we reached rank 100 back in 1993 under Jiří Pešek, and our best since we were ranked 101 in 1996 under Rustam Akramov. Speaking to the media, Indian coach Stephen Constantine told PTI, "It has been a difficult road. Bringing in new blood and creating competition for places in the team has been a process, and I'm pleased we are moving in the right direction. "It's been a total team effort. Unless Mr. Patel (AIFF President Praful Patel) and Mr. Das (AIFF General Secretary Kushal Das) allowed me to do the things and the manner I wanted it to be done, this won't have been possible ever. I also need to thank the support staff for their commitment for the team". India take on Lebanon next, in a 7 June international friendly. Thereafter, the team hosts Kyrgyzstan on 13 June in their next AFC Asian Cup qualifier match. It wasn't a case of just winning for India. The President of the All India Football Federation Praful Patel, along with his colleagues, carefully planned the international schedule to game the FIFA ranking system. The AIFF decided to let the points from previous matches lapse by restricting the number of games the national team played. Safe to say, before this run of 11 out 13 victories, India's performance was below par. In fact, over the past year, India has risen from 163 in April of 2016 to 101 in April of 2017. A move of 61 positions. There is also the issue of India playing non-Asian opponents. That hasn't happened since 2011 when India took on the trio of Guyana, Zambia and Trinidad and Tobago, losing to all three. India's true test will be in their matches against Lebanon and Kyrgystan. 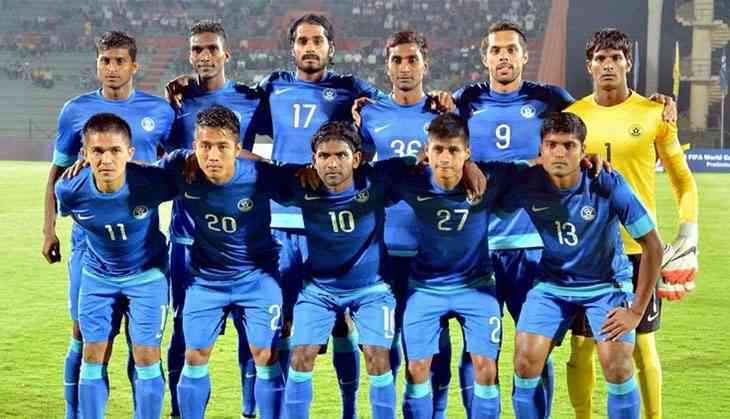 TWEET THIS Winning 11 out of their last 13 matches, the Indian football team has risen to a two-decade best ranking of 101 India's 31 position rise in the FIFA rankings is second only to FYR Macedonia's 33 position move to 133.